Annual data from HUD’s Survey of Market Absorption of New Multifamily Units provide details concerning the types of apartments completed and the speed of rental absorption after construction. In particular, the current edition of the annual report finds that for units completed during 2013, 12-month absorption rates were 94% or higher across building types. The annual report provides details for units located in properties of five or more units, with these elements including geography, number of bedrooms and types of multifamily properties. These variables complement the information we review on a quarterly basis to track market absorption for the multifamily sector. While the data are somewhat old (2013 completions), they are worth examining to track trends for multifamily development, which has led residential construction growth in the wake of the Great Recession. 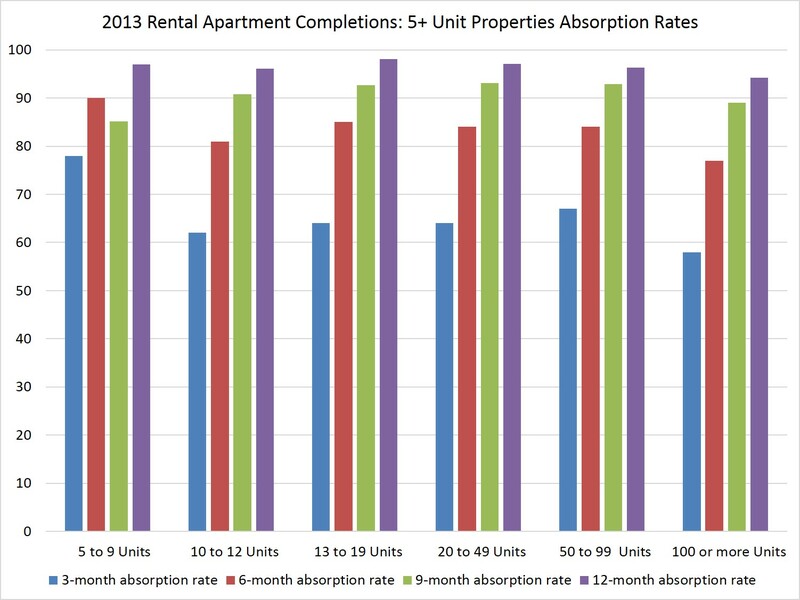 Absorption rates were strong across all rental building types. The chart above provides market absorption rates from 3- to 12-month time periods broken out by the number of units in each building. There is very little difference in rental absorption rates, although a slight trend finds somewhat lower rates for larger properties. This same trend is in place for the number of floors for each building, with slightly lower rates for buildings with six or more floors (data in the HUD report). The distribution of apartments by number of bedrooms is also available in the data. 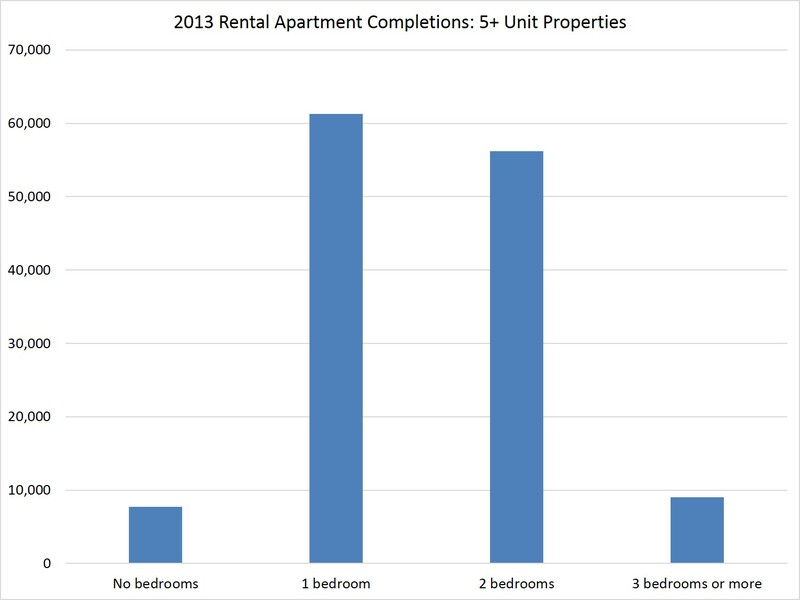 46% of 2013 completed rental units in buildings with five or more units were 1-bedrooms, with another 42% consisting of 2-bedroom apartments. 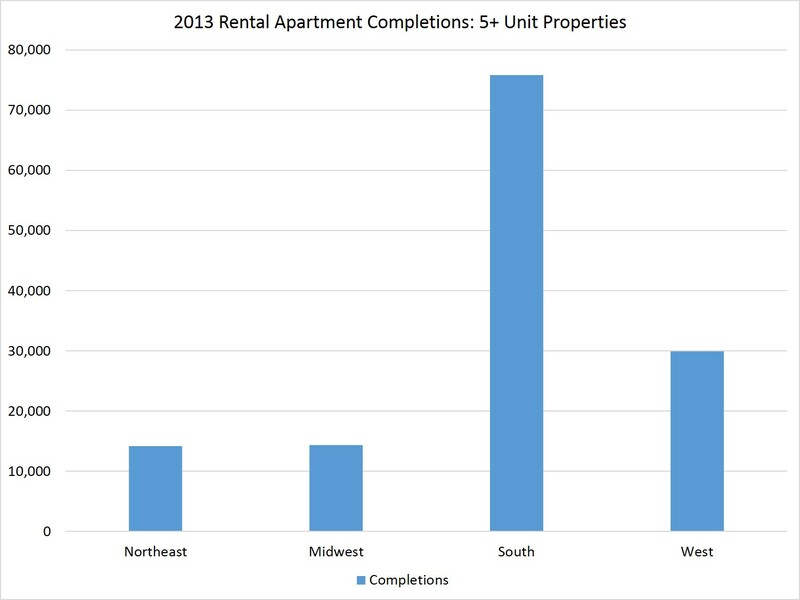 Median asking rent for all apartments was $1,286 for units completed in 2013. Apartments with an asking rent of $950 or less had the highest three-month absorption rate (67%), but there was little difference among the 12-month absorption rates for the various rent classes. Similar to single-family construction, the South led in terms of overall construction. In fact, for this type of multifamily development, 56% of completions in 2013 were located in the South (52% of single-family 2013 completions were in the South according to Census data). The West contained 22% of new construction (23% for single-family). While there were negligible differences in 12-month absorption rates, the Midwest led in terms of 3-month absorptions with a rate of 78%, compared to 60% to 64% for the other three regions. 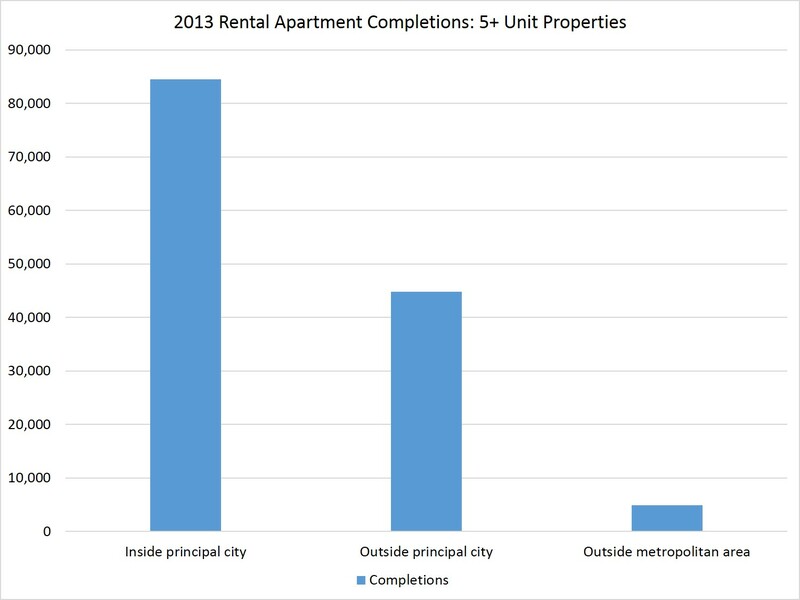 Lastly, the data are clear that this type of multifamily rental construction was concentrated in urban areas. For 2013, 65% of these units were completed inside the principal city of metropolitan/micropolitan statistical areas, with another 35% in the metro area but outside of the principal city. There were few differences for absorption rates among these different geographic areas.